It's Black Friday. People have been talking about the biggest deals of the year for the past few days. But today came round and I found myself wondering what the hype was all about. The best sales of the year just pretty much looked like a typical day on Cardsphere. Or in many cases, not as good as a typical day on Cardsphere. How is this possible? It's all because of incredible efficiency. Cardsphere charges a meager 1% transaction fee (seller only). The rest of the typical margin is split between the seller and the buyer. I tweeted out a picture of our market dashboard and went on with my day. But the thought kept coming back to me. Maybe the dashboard by itself doesn't really tell the story in a way that connects with people. Maybe I should put something more concrete out there. So, I have. ABU Games advertising a 25% discount on singles. Card Kingdom offering 10% store credit on all purchases. Here, I treat this as a 10% discount so we can compare on equal terms. Channel Fireball with a 11% discount on singles. Using MTGGoldfish and EDHREC, I looked at lists of top cards by format and chose a sample of cards for Standard, Modern, EDH and Pauper. I didn't really have a formal selection process, but if you look these cards are near the tops of the lists. I did try to choose cards with a variety of price points, though. Here's a link to the Google Sheet. The card names are linked to the Cardsphere page for that specific printing, where registered users can see the sales history data I used to put the table togther. For the Cardsphere average sale price I only used records for NM cards from up to the last 10 transactions. Also, in some cases the last 10 transactions were spread out widely over a few months, where there could have been price movement. To balance this out I showed the last sale price and the date on which that sale took place. I know you have some questions. So let's get right to it. How do I know you didn't cherry pick cards in Cardsphere's favor? I completely admit my selection process was about as ad-hoc and informal as you can get. So, I strongly encourage you to take five minutes and register for a completely free Cardsphere account. Once you have you can do the same comparison for just about every card in existence, and I'm confident you'll find similar results. You can also engage with our community on Discord, Twitter, Facebook, and Reddit and they'll back up the numbers with all the anecdotal evidence a marketer could ever want! If buying on Cardsphere is great, then selling must be awful? Not at all. For the overwhelming majority of cards you still do better than even the most aggressive buylists out there. Factor in the opportunity to throw in random cards that are not buylistable elsewhere and you can really make quite a bit of money. What about store credit bonuses? Some are as large as 30%! This is where the comparison gets difficult for a lot of people. When you factor in store credit bonuses, the most aggressive buylist prices close in on Cardsphere prices. But that's where you need to look at things critically, and compare the buying power of the US dollars in your Cardsphere account versus store credit elsewhere. 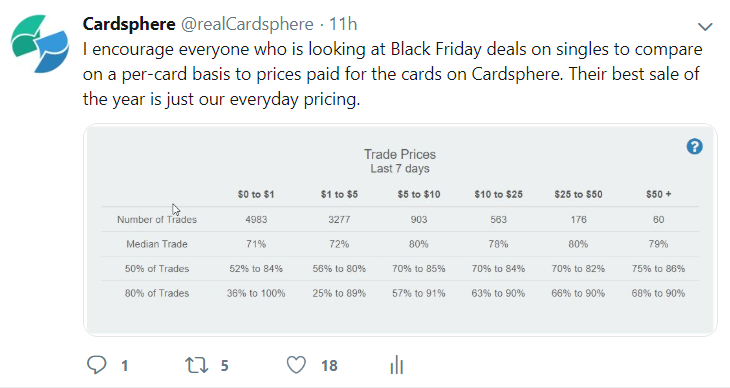 You always get great deals on Cardsphere, so having more store credit to pay those higher retail prices often will not make up the difference. People often sign up for Cardsphere expecting buttons that say "buy this card now" and that's not the way things work. Cardsphere is a peer-to-peer market where sellers initiate transactions with buyers, so you can't always get cards as quickly as you could with a big retailer. So when you absolutely must have the cards in time for Friday Night Magic, we recommend you go with a retailer. All the same, we put out a lot of data so people understand our market and have their expectations set properly. Once a trade has been committed, cards are generally delivered quickly. The most common shipping scenario is USA to USA, and half of all these cards (389,611) were delivered in under 5 days from being committed.